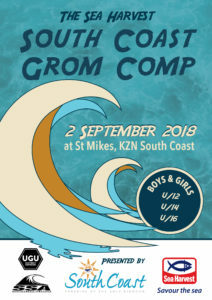 Sunday September 2nd – St Mikes, KZN South Coast: National Junior Team members, Kayla Nogueira of Umhlanga and Luke Thompson of Durban won the U16 Girls & u16 Boys titles respectively at the Sea Harvest South Coast Gromcomp presented by South Coast Tourism at St Mike’s (St Michaels on Sea) on the KZN South Coast yesterday. Both surfers worked hard for their wins in the contestable 3-4 foot surf and their victories in the premier divisions at the event earned them some much needed prize money and a handful of SA Surf Tour ratings points. Talented Gabi Herbst of Durban came second to Nogueira, Sarah Scott of Kommetjie took third spot and Anastasia Venter of Melkbosstrand was fourth. Herbst, Scott and Venter are all under twelve years old and the three competitive young surfers are certainly the future of South African Women’s surfing. In the U16 Boys Final Thompson beat fellow Durban surfer and team mate in the National Junior Team, Tide Lee Ireland into second place. James Ribbink of Durban North was third and Dominic Southwood of Ballito came fourth. In the U14 Boys Final Ribbink turned the tables on Thompson to take the win. Matt O Brien of East London was third and Christian Venter of Melkbosstrand came fourth. In the U12 Girls Final Sarah Scott edged Anastasia Venter into the runner up spot with local girl, Mayah Potgieter taking third ahead of Gabi Herbst. A stoked Matt Canning of Durban, son of former National team member and Pro surfer, Paul Canning, took the U12 Boys title ahead of Josh Malherbe of Coffee Bay. Josh is the son of David Malherbe, another former National Team member and Pro surfer who competed against Paul on many occasion in the late 80’s and early 90’s. Ntokozo Maphumalo, a product of the SA Surfing Legends High Performance Academy, was third and fellow Durban surfer Kai Hall came fourth. 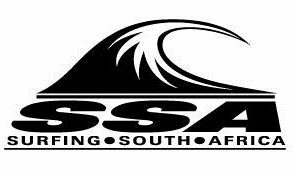 Surfers from all parts of the country competed in this 1A rated South African Surf Tour Event which offered in excess of R15000 in prize money and SAST ratings points across the five divisions. The Sea Harvest South Coast Gromcomp presented by South Coast Tourism was expertly hosted by the Ugu Surfriders committee and was supported by local companies such as C Bali who provided all the meals for the officials. Liveheats provided the scoring system which was used on both days of competition.